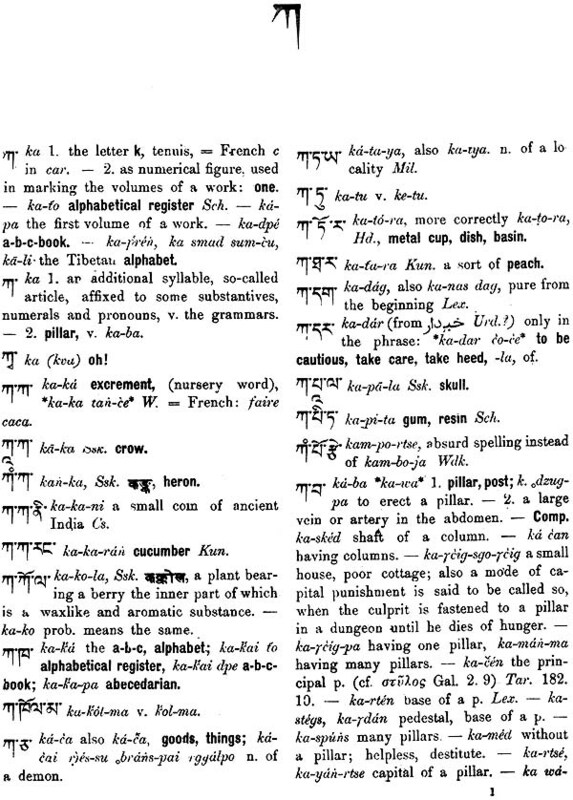 The Present Dictionary is an attempt to give a rational account of values and meanings of words in Tibetan language, to distinguish the various transitions in periods of literature and varieties of dialect, and to make sure of each step by the help o accurate and copious illustrations and examples. The author has not restricted himself only to the Classical Period of the Tibetan literature. He has endeavored to deal with the Tibetan language as a whole. His dictionary derives its matter and principles equally from the literature and from the speech of the people. Each word has been made the object of observation in its relation to the content as it occurs in books, and in its value and place among others when it is used in common conversation. But in the latter case it has been an uphill task, since the spoken language has as many dialects as the country its provinces. However an attempts has been made to define the range and fix the meaning of current words as far as possible. A number of diacritical marks have been used, following the system of Prof. Lepsius, for the exact pronunciation of Tibetan letters and words. The marks are of manifest description and cannot be startling to any general reader. The book is documented with Introduction which contains Tibetan Alphabet, phonetic table for comparing the different dialects, abbreviations and the method of pronunciation. To increase its usefulness, the author has added at the end an English-Tibetan Vocabulary which will be welcomed by the readers and will be serviceable to the general cause of learning the Tibetan language. Sarat Chandra Das Compiled from a large number of Tibetan and Sanskrit works, the work represents the arduous labour of the author for 12 years. Here the Tibetan words are given in alphabetical order, with their accepted Sanskrit equivalents, followed by the English meaning. All the technical terms are illustrated from extracts from Sanskrit-Buddhist and Tibetan works. 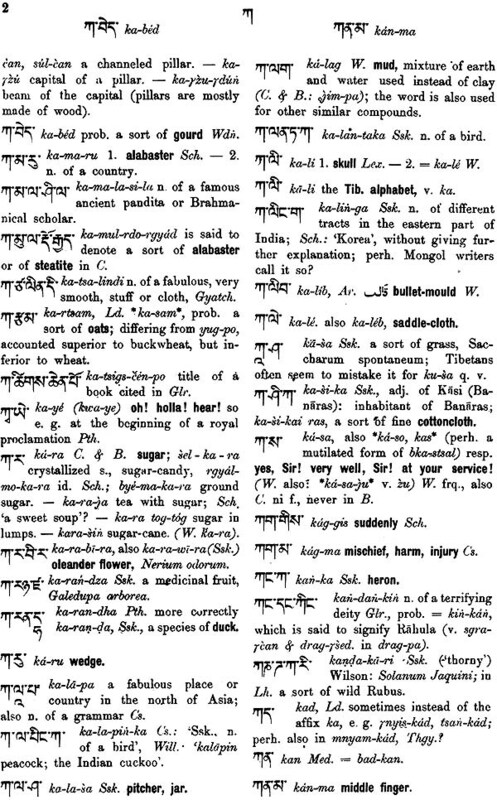 The author has included modern Tibetan words which were not given by Köros and Jaschke. The great Tibetan scholars Rev. Graham Sandberg and Rev. A. William Heyde thoroughly revised the original and gave a scientific look for the work, giving an impression of a Tibetan Cyclopaedia. The author has dealt with both Literary and Colloquial Tibetan mostly in usage around Lhasa. The important and elusive subjects of pronunciation and spelling are given on principles more systematic and accurate, highlighting the subtle distinctions. The so-called Verb has also been elaborately treated in the body, keeping in view the genius of the Tibetan sentence the construction of which is unique. The entire grammar is given in Three chapters—Ch. I Preliminary; Ch.I Etymology; Chill Appendix of Conjugations. AND DICTIONARY (2 VoIs.) Franklin Edgerton This is the first attempt at a description of the grammar and lexicon of Buddhist Hybrid Sanskrit (BHS). Most North Indian Buddhist texts are composed in it. The author has excluded from the grammar and dictionary all forms which are standard Sanskrit, and all works which are used in standard Sanskrit with the same meanings. Heinrich Jaschke (1817-1883), a missionary of the Moravian Mission Society, went to Lahaul and Ladakh and became well-versed in the Tibetan language. Jaschke wrote a number of text books for Tibetan children and began translation the Bible into Tibetan. He wrote a short practical Grammar of the Tibetan Language with special reference to the spoken dialects, 1865, Romanized Tibetan –English dictionary,1866 and Introduction to the Hindi and Urdu Languages for Tibetan Language in German. He translated it into English and published it in 1881 in London. Jaschake also contributed papers on the pronunciation and phonetics of the Tibetan language. He translated some of the songs of Milaraspa into German. This work represents a new and thoroughly revised edition of a Tibetan-German Dictionary, which appeared in a lithographed form between the years 1871 and 1876. During a residence, which commenced in 1857 and extended over a number of years, on the borders of Tibet and among Tibetan tribes, I and my colleagues gathered the materials for this Dictionary. We had to take primarily into account the needs of missionaries entering upon new regions, and then of those who might hereafter follow into the same field of enterprize. The chief motive of all our exertions lay always in the desire to facilitate and to hasten the spread of the Christian religion and of Christian civilization, among the millions of Buddhists, who inhabit Central Asia, and who speak and read in Tibetan idioms. A yet more definite object influenced my own personal linguistic researches, in as much as I had undertaken to make preparations for the translation of the Holy Scrip lures into the Tibetan speech. I approached and carried forward this task by way 0 a careful examination of the full sense and exact range of words in their ordinary and common usage. For it seemed to me that, if Buddhist readers were to be brought into contact with Biblical and Christian ideas, the introduction to so foreign and strange a train of thought, and one making the largest demands upon the character and the imagination, had best be made through the medium of a phraseology and diction as simple, as clear, and as popular as possible. My instrument must be, as in the case of every successful translator of the Bible, so to say, not a technical, but the vulgar tongue. Thus, in contrast to the business of the European philologist, engaged in the same domain, who quite rightly occupies himself with the analysis and commentary of a lit5- rary language, the vocabulary and terminology of which he finds mainly deposited in the speculative writings of the Buddhist philosophers, it became my duty to embrace every opportunity, with which my presence on the spot favoured me, to trace the living powers of words and of expressions through their consecutive historical applications, till I reached their last signification in their modern equivalents, as these are embodied in the provincial dialects of the native tribes of our own time. Iv transitions in periods of literature and vaneties of dialect; 3. to make sure of each step by the help of accurate and copious illustrations and examples. I have done my utmost to arrive at certainty ‘where, heretofore, much was mere guess-work, and I cherish the hope that, from this point of view, my contribution will ‘e welcomed by the comparative philologist, and will be serviceable to the general cause of learning, as well as a useful! Volume within that narrower circle, whose requirements I was specially bound not to overlook of persons whose main purpose is to be taught how to write and speak the modern Tibetan tongue. There are two chief periods of literary activity to be noticed in studying the origin and growth of Tibetan literature and the landmarks in the history of the language. The first is the Period of Translations which, however, might also be entitled the Classical Period, for the sanctity of the religious message conferred a corresponding reputation and tradition of excellence upon the form, in which it was conveyed. This period be’- gins in the first half of the seventh century, when Thonmi Sambhota, the minister of king Srongtsangampo, ‘was sent to India to learn Sanskrit. His invention of the Tibetan alphabet gave a twofold impulse: for several centuries the wisdom of India and the ingenuity of Tibet laboured in unison and with the greatest industry and enthusiasm at the work of translation. The tribute due to real genius must be awarded to these early pioneers of Tibetan grammar. They had to grapple with the infinite wealth and refinement of Sanskrit, they had to save the independence of their own tongue, while they strove to subject it to the rule of scientific principles, and it is most remarkable, how they managed to produce translations at once literal and faithful to the spirit of the original. The first Masters had made for their later disciples a comparatively easy road, for the style and contexts of the writings, with which the translators had to deal, present very uniform features. When once typical patterns had been furnished, it was possible for the literary manufacture to be extended by a sort of mechanical process A considerable time elapsed before natives of Tibet began to indulge in compositions of their own. When they did so, the subject matter, chosen by them to operate upon, was either of an historical or a legendary kind. In this Second Period the language shows much resemblance to the modern tongue, approaching most closely the present idiom of Central Tibet. We find a greater freedom in construction, a tendency to use abbreviated forms (thus the mere verbal root is often inflected in the place of a complete infinitive), and a certain number of new grammatical combinations. V meaning etc. In my own case, I was forced from the beginning to compile my own German-Tibetan dictionary, and found myself for all practical purposes thrown back upon my own resources. But the cause of truth appears to require a further word or two in regard to the Lexicon by Professor I. J. Schmidt of St. Petersburg, the relation of that work to its predecessors having been left by its author in some obscurity. 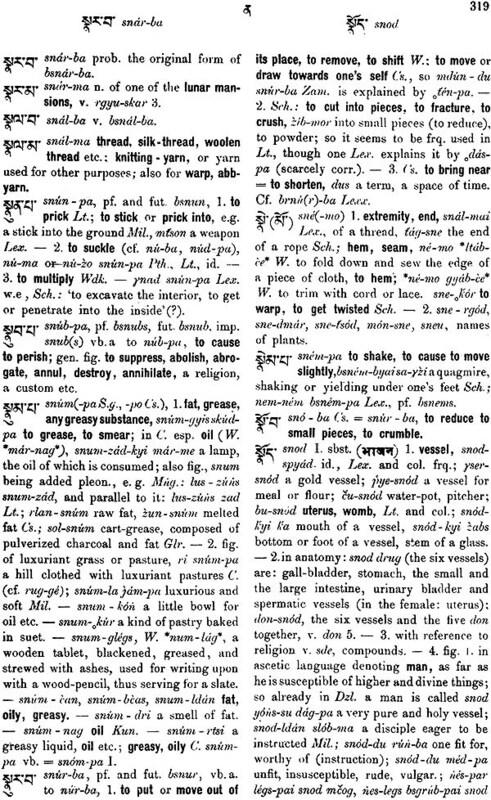 The first Tibetan dictionary, intended for European students, was published at Scram- pore, as long ago as 1826. It contains the collections, amassed in view of a dictionary and grammar, by a Roman Catholic Missionary, who was stationed in eastern Tibet or eastern to the frontier in Bhutan. There was nothing to assist him, except the scanty contributions, given by Georgi, in his Alphabetum Tibetanum. He had to cope with an entirely unworked language. He evidently took the one way possible of making acquaintance with it, sufficient to enable him to understand, to speak, to read and write. Each word or sentence was jotted down, as soon as it ‘was- heard, or was committed to ‘writing, at the request of the learner, by some native expert. After a while, the attempt could be made to master a book. In the instance of our missionary, Padma Sambhava’s book of wends appears to have been selected, a work which represents rather a low level of literature, yet just on that account, perhaps, as a specimen of popular and current literature, not unsuitable to start from. Then, step by step, as best he could, our missionary had to possess himself of some abstract views, which would serve as a preliminary basis for a grammar. And had it keen granted to this first occupant of the field to reduce his materials to an ordered system and to prepare them himself for publication, it is possible that in Europe the knowledge of the Tibetan language might have reached, some fifty years earlier, the stage at which it has now arrived. The very name of that Roman Cathilic missionary, however, has been lost. The papers which he left behind him, unsorted and unsifted came into the hands of Major Latter, an English officer, and were passed on by him to Mr. Schroter, a missionary in Bengal. English was substituted for the Italian of the manuscript, and the East Italian Company made a grant which defrayed the cost of the Tibetan types and the further expenses of printing. But there was no Tibetan scholar to correct the proofs. The author himself would doubtless, on reconsideration, have detected and dismissed much erroneous or unnecessary matter. As it was, many additional mistakes crept in during the passage through the press. Thus the work, though it has a richer vocabulary than can be found in the later dictionaries, cannot on any questionable point be accepted as an authority, and has only value for those who are already competent, for themselves, to weigh and decide upon the statements and interpretations it advances. I have not been able to extract from it much that was serviceable to me. Nevertheless, any one who knows by experience what time and toil such a work must have cost, though its design remained unfulfilled and its object unaccomplished, will not easily be able to repress his indignation at the tone, in which this book in the preface to his Grammar (p. VI) is recklessly and absolutely condemned by Professor Schmidt. vi phrases are quoted as examples, they are almost without exception in the dialect of the Kangyur, and of little practical value. This Tibetan-English dictionary by Csoma has been adapted for a German public by Professor 1. J. Schmidt of St. Petersburg. 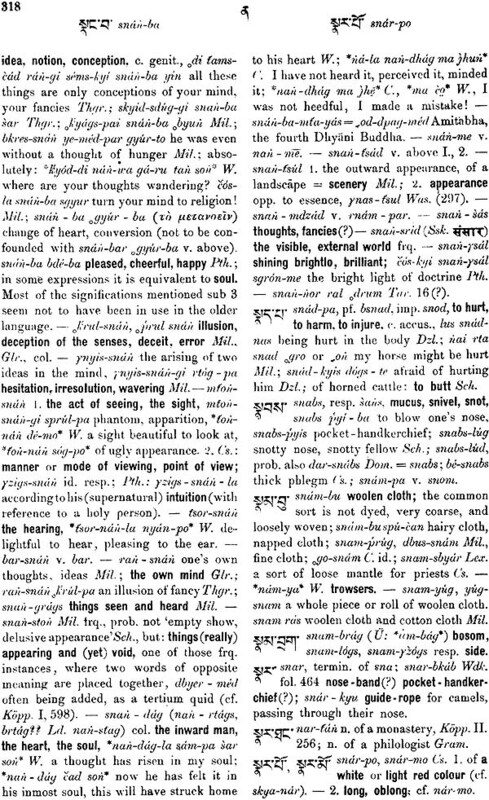 The translation from English into German is good; in the general alphabetical arrangement improvements have been introduced, and such as are- in conformity with the spirit of the language; moreover, three Mongolian dictionaries have been consulted, and from these a certain number of words have been supplemented. But it cannot be said that even on the work of revision Professor Sc h mid has bestowed much pains. For example, Csoma’s rough grouping of words under the principal headings is left unaltered, though here especially a reduction to alphabetical order was obviously required. Mistakes and superauities, very pardonable in the case of a first issue of an original publication, are repeated in this translation, and these cannot be so readily overlooked and condoned, when they are made at second hand, and are sanctioned and subscribed to by one, who has assumed so severe a critical and editorial attitude. 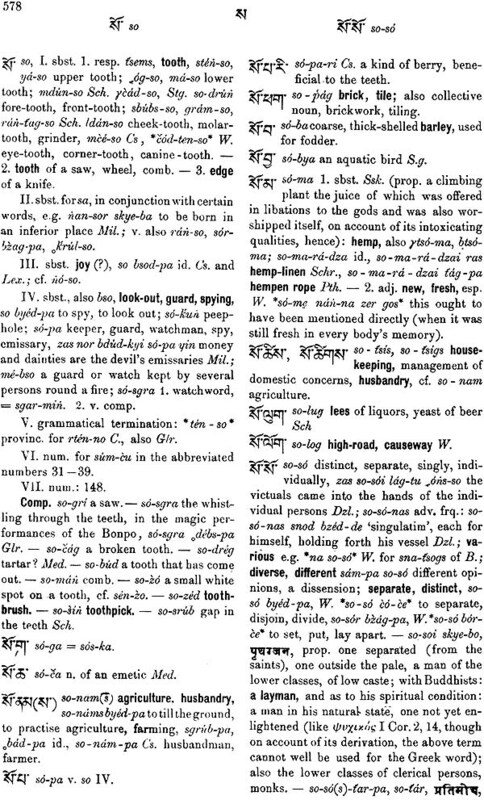 The national dictionaries of Tibet itself, so far as I have met with such, are either little handbooks, meant only to furnish a correct orthography, or they are glossaries of antiquated forms. The absence of an alphabetical order in them makes the business of reference very troublesome. It is by great good luck that one sometimes finds an otherwise unknown word after a prolonged search. My own dictionary, in the main, pursues the object and accepts the plan of the work,- which was published by Mr. Schröter. As I said at the beginning, I have not restricted myself to the Classical Period, but I have endeavored to deal with the Tibetan language as a whole, though I do not pretend to have performed this task exhaustively. My dictionary derives its matter and its principles, so far as possible, equally from the literature and from the speech of the people. Each word has been made the object of observation in its relation to the contest as it occurs in books, and in its value and place among others when it is used in common conversation, and then the attempt has been made to define its range and to fix its meaning. All the words, cited by Csoma and Schmidt, even such as I myself had never seen or heard, I have embodied in this work, stating, in each case, the source from whence I drew them. 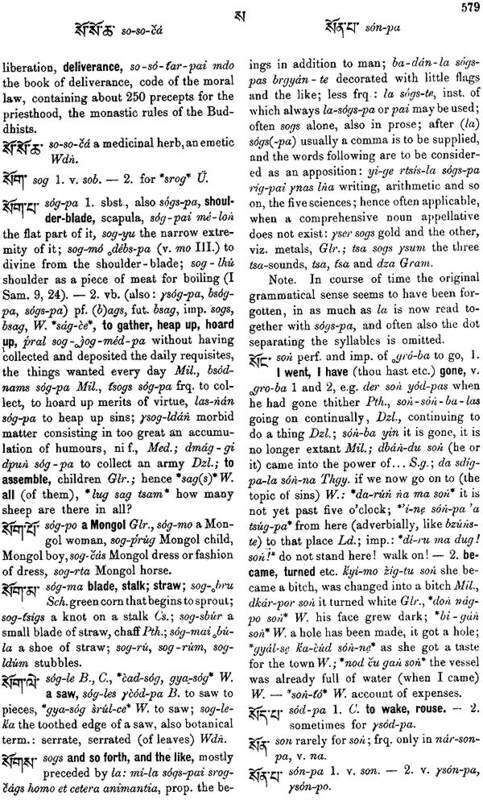 The great number of diacritical marks will perhaps prove irksome to the English reader; yet, they were not to be dispensed with, if the pronunciation of Tibetan letters and words was to be represented with any degree of exactness, and the method of Prof. Lepsius seemed the most eligible among all the systems available for my purpose. The student, however, need not be disheartened, as he is not obliged to make himself acquainted with all the minutiae of the system, but need only direct his attention the peculiarities of that dialect, within the limits of which his inquiries, for the time, are confined. And by-the-by it may be observed, that the multitude of little marks, of manifold description, cannot be startling to the Indian reader, who was ever necessitated to make himself familiar with systems quite as complicated, as e.g. the Urdu alphabet. Vu in consideration of the peculiar difficulties, which attach to the execution of a work like the present, and which, moreover, were not a little increased, in this instance, by the fact that the compositors of the press were altogether unacquainted with English. I should be guilty of great ingratitude, if I were not to mention my obligations to two friends, without ‘whose kind and efficient aid it would have been impossible for me in my present infirm state, to complete this work, which was commenced in the days of health and vigour, viz, to the Rev. T. Reichelt, formerly a Missionary of the Moravian Church in South Africa, sod to Mr. F’. W. Petersen, a relative of mine. Further, I desire to record my obligations for various acts of kindness, encouragement, assistance and advice, during the prosecution of my researches and the completion of my work, to A. C. Burnell Esq. M. R. A. S., in India; Dr. E. Schlagintweit in Bavaria, Dr. Thom son and Dr. Aitchison of Kew, Dr. Kurz of Calcutta, and R. Laing Esq. M. A., Fellow of Corpus Christi College, Oxford. Not the least debt of gratitude is that which l owe to Dr. R. Rost in London, Secretary of the Royal Asiatic Society, to whose exertions, indeed, the execution of this work is, properly speaking, entirely due, inns much as he kindly interested the Indian Government on behalf of my undertaking.